SEOUL, March 20 (Yonhap) -- Prime Minister Lee Nak-yon said Wednesday inter-Korean economic cooperation should be pursued in a way that does not hamper international sanctions. Lee also expressed hope that cross-border economic exchanges could induce North Korea to give up its nuclear program. "Under the current sanctions regime, it is possible to seek exchanges in such areas as culture, academia and sports. So there is a need to focus on those areas," Lee said at a parliamentary interpellation session on foreign and security affairs and unification. Lee added he views as a positive development a recent sanctions waiver by the U.N. Security Council and the United States for the shipment of equipment to North Korea for video reunions between members of separated families. His remarks came amid concerns that Seoul's possible push for resuming key inter-Korean projects may deepen a rift with Washington, which is keeping up its pressure campaign on North Korea until Pyongyang gives up its nuclear weapons. President Moon Jae-in raised the need to reopen the shuttered industrial complex in North Korea's border city of Kaesong and resume a long-suspended tour program on the North's Mount Kumgang as he hopes to prod Pyongyang to stay on the course of dialogue. U.S. President Donald Trump and North Korean leader Kim Jong-un ended their summit last month in Hanoi without any agreement, as they differed on the scope of denuclearization and sanctions relief. Seoul's unification ministry said Monday it will undertake preparatory work within the framework of global sanctions for the resumption of the two major suspended projects with the North. Seoul's Foreign Minister Kang Kyung-wha made the same point, saying during the Wednesday session that it is necessary to "fully abide by the sanctions" as long as North Korea does not take detailed denuclearization measures. "As sanctions against Pyongyang are made by the international community, any decision on their easing or lifting should also be made through the same process," she said. Stressing that it is "too hasty to say that North Korea lacks a will to denuclearize," the minister noted that it is "our task to prompt the North to take steps." 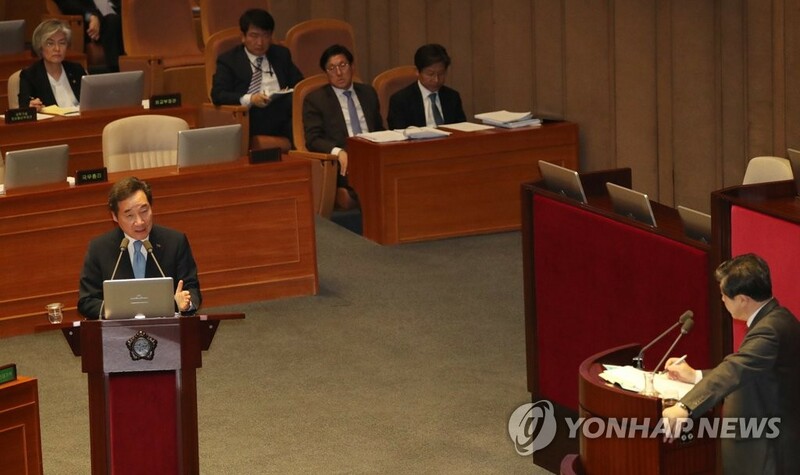 Attending the parliamentary session, Defense Minister Jeong Kyeong-doo vowed to "thoroughly block" any moves for nuclear proliferation by North Korea in cooperation with the international community. "Intelligence authorities of South Korea and the U.S. have kept close tabs on North Korea's nuclear and missile related activities and maintain a firm defense posture," he stressed. Asked about recent signs of Pyongyang's rebuilding of the Dongchang-ri missile launch facility that it partially dismantled last year, he said he's "fully aware about what is going on," though he refrained from commenting on the North's intention behind such moves.